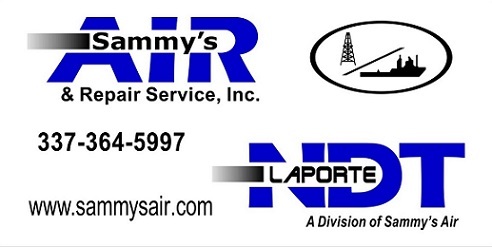 Sammy's Air & Repair, Inc., a family owned business with over 100 years combined experience in the oil & gas industry was founded in 1983 by Sammy Laporte. His dedication to hard work & service with a personal flair still remains the number one priority today. With 24/7/365 service we are always on standby to handle customer needs. Sammy's Air & Repair, Inc. Repairs, Tests, Certifies, distributes and services pneumatics, pneumatic assessories, pneumatic/electric, high pressure iron repair, inspection (visual & UTT) and hydrostatic test certification products/services.